This article provides steps on how to create a stiff diagram displaying cation and anion concentrations in Grapher. A stiff plot is used by hydrologists to compare ionic composition of water samples. 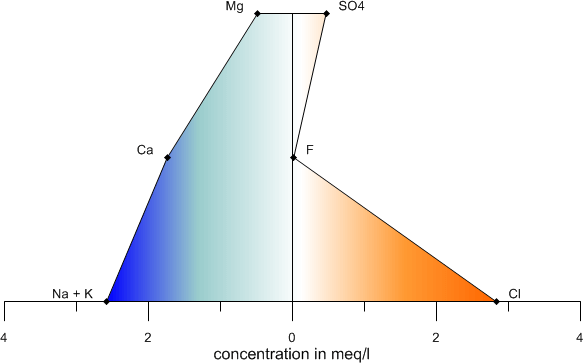 Typically, the left side of the diagram shows cation concentrations and the right side shows anion concentrations. The further a point is from the center of the graph, the larger the ionic concentration. Click the Home | New Graph | Specialty | Stiff Plot ( ) command. Select the data file and click Open to create the graph. The data must have the cations and anions in separate columns, with each value on a separate row. Here is an example. This example uses part of the data located in the Samples file named stiff data.xls. Note that some columns are hidden in this image. The cation and anion data for the lake water concentrations. In the data above, Columns A and E are the label columns (the columns that contain the cation and anion names). Columns B and F are the data values being plotted. The value determines how far away from the center 0 line the point is located. In the graph below, the cations are on the left side and the concentration increases to the left. The anions are located on the right side and the concentration increases to the right. This is an example of a stiff plot created displaying the lake water concentrations.